One of the most useful aspects of WordPress’s design is the ability to build your site around a predefined theme, making it possible for you to create a cohesive, experience without any specialist web-design knowledge. This design philosophy means you can create a professional blog or site for practically any purpose with just a laptop and a simple strategic plan. Selecting the correct theme for your site should form the cornerstone of your strategy. While content is what will attract people, an appropriate, easily navigable user-interface is what will make them stick around. If you have used other social media outlets, then getting to know the intricacies of WordPress will be a piece of cake. Operating much in the same way as Blogger or LiveJournal, WordPress allows the user the ability to create content and distribute it within the framework of a website structure, while sacrificing none of the user-friendliness inherent in the aforementioned products. Lots of people use WordPress for business and personal use. However, regardless of the purpose, you are going to need reliable WordPress Hosting Provider and a good theme to get your site off t he ground. The adage that “it’s what’s inside that counts“, unfortunately, does not apply when it comes to the user being bombarded with billions of different websites at any given time. Your site either stands out from the billions that surround it or it does not. And then what is left of your good intentions? The fact of the matter is that before you even decide on content, you must first pick the look or theme for your site. The most important thing you have to do before searching for a good theme is to identify your demand and requirement. You only need to look at WordPress Theme’s section to see that some have been designed with written content in mind, while some are geared solely towards showcasing images. There are also more “balanced” themes that are geared to accommodate text, images, and video. With tablets and mobile devices now becoming as important as the laptop and desktop for social browsing, some themes are now being designed as “hybrids” for mobile and non-mobile devices. Then there is growing popularity of Newspaper style, Photo/Image themes or themes with Featured posts, or other advanced features. 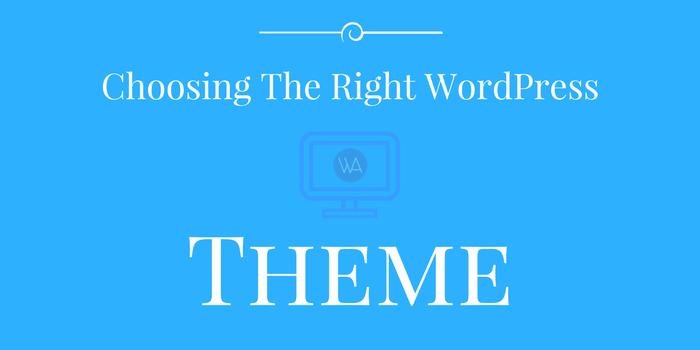 Consider the extra steps involved in setting up and properly using these types of themes. Do you have the ability to resize the images needed? Does the theme come with instructions for its setup and use and can you understand and follow the instructions? Further, pay consideration to these questions: What do you need for your site? A one-page portfolio site for showing off your resume? A blog site for blogging, sharing your knowledge? An e-commerce site for selling online items. What functions are you looking for? Slider, event calendar, Google maps? After answering those questions, you can start looking. Choosing a theme for your WordPress blog is something that most new bloggers do before even getting their site up and running. It’s important to choose the right WordPress theme that fits your design needs. But what is more important is to choose the one that fits your knowledge level or learning aptitude. You want to pick something relevant to what your site will be about, but you also want to pick something that is aesthetically pleasing to the eye. Granted not all of you reading this took courses in graphic design, but most human beings know what combinations of colors and shapes and content look good and are pleasing to the eye. There are also quite a few references online that can help you with this as well as an avid community of developers who create free WordPress themes for use on sites. The first most important factor in choosing a WordPress theme is to decide whether to go for a free theme or a paid one. I never used free themes as the majority of them are not updated regularly. Further, free themes lack in providing excellent support and features. However, if you are a complete newbie, use free themes initially to learn the art of customizing WordPress design elements. Here is an awesome free theme: SEO WP developed by WPArena. Try it. The second thing to consider while selecting a perfect WordPress theme is its design elements. Let’s take a look at it. Color Scheme – The color scheme of the theme may be something else to consider. If you like a theme but want to change the color scheme, then consider the time it will take you to learn how or how much it will cost to pay someone for the change. Some WordPress themes use background images, so changing those will require some imaging software and knowledge. Other color changes will require at least some CSS and HTML knowledge or at least the ability to use Google to learn those basic skills. Header – The WordPress theme header, probably the first thing many want to be addressed. Some WordPress themes don’t display the blog’s name and tagline (or description) and use an image. When looking at a prospective theme, check the header image to see if the blog name is part of the image. Right click the header and see if you can view the image. If it has the name on the image, then you will need to create your own, so consider if you can do that or pay someone to do it. If you already have an image you want to use on the WordPress theme, compare the size and area of the themes header to the image you want to use. Are they similar, or are editing the image or theme’s code going to be needed for a proper fit? Here is how to edit a Theme Header. Navigation – Navigation is also an important factor as it keeps the user busy on your site and exploring the content becomes easy. Look at the theme navigation menus. Like, if you need a header menu as well as a footer menu, then your choice must consist of both navigations. WordPress provides built-in support for navigation menus, so it’s useless to go for a theme without a proper navigation menu. Learn how to custimize navigation menus easily. Customizer – Some themes provide customization options like changing the color scheme, site-layout and much more via WordPress built-in customizer. So, also consider the theme options panel or customizer depending on your skills and needs. Sidebar – As per your needs, you can choose a theme with single sidebar, two sidebars or even with no sidebar. Learn how to tweak your sidebar easily. Widget Ready – Make sure it is “Widget Ready” and if it is AdSense ready, or has other embedded ads on it be sure to read the instructions for the locations of the ads and how to change them to your links or code. Footer – Select perfect WordPress theme with a great footer that fits with your situation. Like, if you need a widgetized footer or a subscription box in the footer, then go for it. Responsive Design – Always, choose responsive design templates and if your template is not responsive and you picked it up for your next project, then use WPTouch Pro to make it responsive. Compatibility – Make sure the theme is compatible with latest WordPress version and if it requires plugins make sure those plugins are also compatible with latest WordPress version. WordPress themes are growing more complex with things like embedded ads or email feed subscriptions in the header or sidebar. Some have built-in plugin support that requires certain plugins for the theme to display properly. These are all things that need to be considered before choosing a WordPress theme. If you are a relative WordPress newbie and don’t know how to edit the theme to change the embedded ads, or how to acquire the feed email subscription code and where to place it in the theme, then you may want to choose a different theme. If you have basic HTML or code knowledge and the theme comes with some type of a “Read Me” file or online instructions, then check it out to see if you can handle the task. These are all things to consider when choosing a WordPress theme. Remember that the theme doesn’t hold your content, so changing the theme will only change how it is shown. I always tell new people to choose a decent theme and just get started, learn about WordPress and the look or theme of the blog can evolve and change as your knowledge grows. 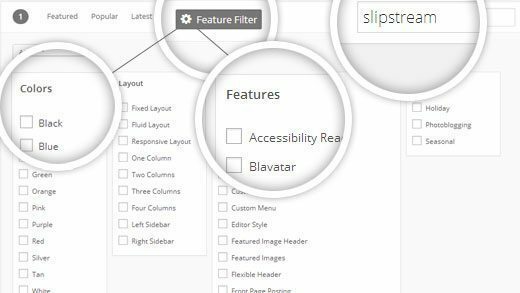 This option will save you a lot of time going around the internet to look for the right theme cos the best themes for each topic are collected and reviewed in the all-in-one article. What you have to do is read through those articles and choose the best fit for you. ThemeForest is the biggest marketplace which every WordPress developer knows. It contains thousands of WordPress themes, plugins and other things. That means you will have so many choices when looking around here. Also Read: Tips for Choosing the Best Premium WordPress Theme in ThemeForest. Creative Market is another famous WordPress theme market place where provide many high-quality themes. Even you are a fastidious one; this market still is able to satisfy you. The major difference of Creative Market is all WordPress theme here is 100% GPL license. If you care about theme licensing, take a look at this place. Search and download a theme from Featured/Popular/Latest theme categories of WordPress official Themes directory. After uploading your theme .zip file here, it will be extracted to WordPress theme folder in wp-content/themes in the WordPress folder. You also can extract the file manually then the same result will be returned. The new theme will be available to activate in the Appearance/themes list of WordPress dashboard. Now, surely installation of a WordPress theme is not a big deal anymore. As in real life, the first impression is very important when it comes to the internet and your WordPress site. You want something that people will remember in good words and easy to navigate – not something that was a chore to get through and ultimately benefitted no one. One of the most powerful features of WordPress is it allows you to change the website front end using a WordPress theme easily. Choose WordPress theme with high quality is one of the most time-consuming tasks for any WordPress beginner who wants to create a beautiful website using WordPress. I hope this article will give you some suggestions and choices to have good ones.